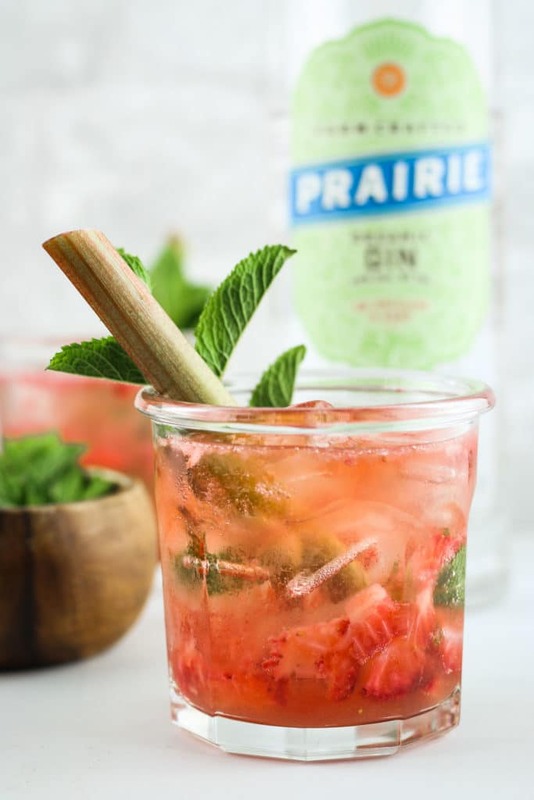 This strawberry rhubarb gin smash recipe is a refreshing, colorful cocktail that’s perfect for summertime – or year round! It’s simple to make at home but it tastes like something a fancy mixologist whipped up. Raise your hand if you love front porch sitting. And patio sitting. And rooftop sitting. And wherever else you can sit outside at dusk, appreciating life, good company, and an easy sipping cocktail. ‍♀️ As for me, I’m gonna be back-of-the-new-house-makeshift-balcony sitting all summer long. Yep, that’s a thing now. That’s where we enjoyed this gin smash after a long day of painting and making a trip to the paint store, and then painting some more. So right now? We’re making gin smashes. Because the strawberries are SO good right now. And I got a batch of fresh rhubarb from my local source.  And I snipped some insanely fragrant, fresh mint from our little herb garden. 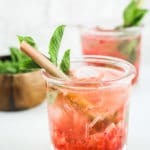 This cocktail is so simple to make but it looks and tastes fancy. It’s a guaranteed showstopper. 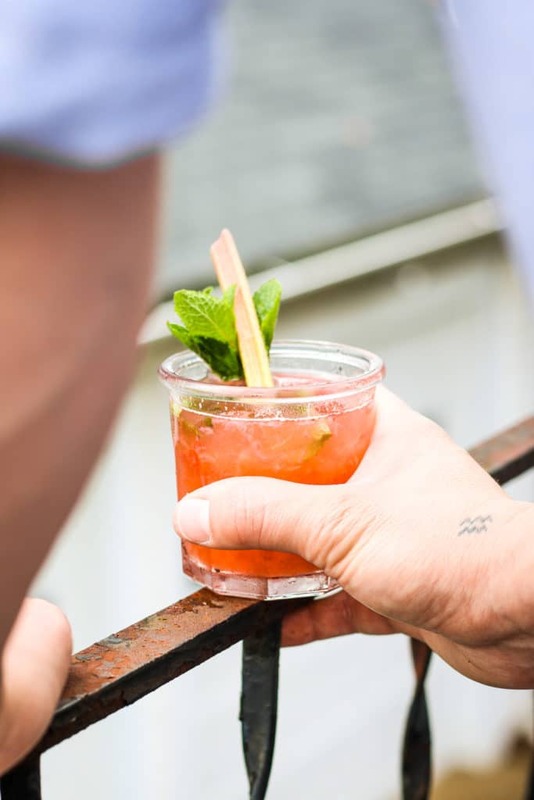 Your friends might just think you completed a mixology class over the winter. That COLOR. I mean, come on. If you’ve never seen a Midwest sunset, now you know what it looks like. ‍♀️ THIS drink. Clean and chop rhubarb stalks into 1/2″ chunks. In a medium saucepan, combine chopped rhubarb, sugar, and water. Stir to combine. Bring to a boil and then decrease the heat to a low-medium simmer. Continue cooking for 40 minutes to 1 hour, until the mixture thickens. Allow the rhubarb mixture to cool for 20 minutes. Place a fine mesh strainer over a bowl, then pour the rhubarb mixture into the strainer. Once it has thoroughly cooled, it can be added to cocktails. 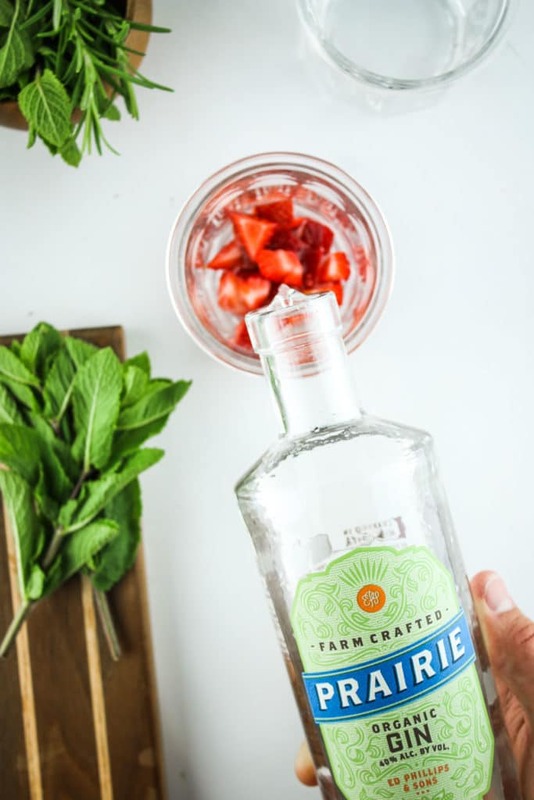 In an 8 ounce glass, add strawberries and mint. Gently muddle. Then pour in 1 ounce of rhubarb simple syrup. Add ice, gin, and soda water, then give it a quick stir. 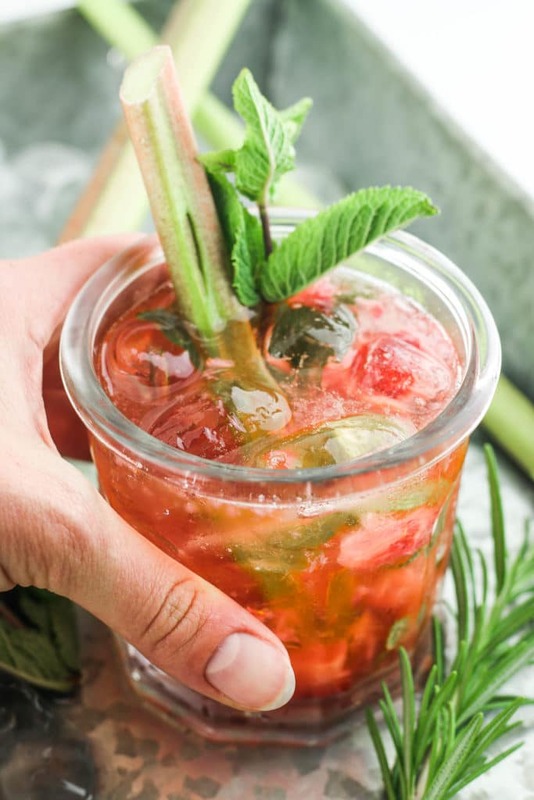 Garnish with fresh mint, strawberry slices, rhubarb stalks, etc. And enjoy! I simply cannot say no to this drink. 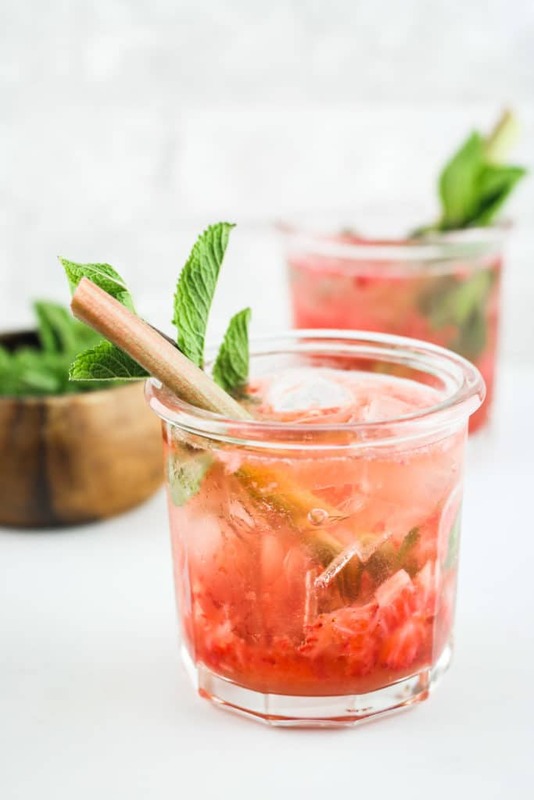 The combination of strawberries and rhubard is the best and just blown away with your photography! This is my kind of drink! It’s gorgeous and sounds perfect for serving at my next BBQ get together. These would definitely be a hit at a BBQ! You have me sold!! Oh my goodness I love a good gin!!! This brand sounds amazing!! What a unique drink…sounds so amazing and looks so refreshing! I’m going to have to give this one a try! Me too! I’m a bit of a gin snob and this is the best I’ve ever tried. I hope you enjoy! This would be perfect for an after dinner drink on this crazy hot day! I love how drinking gin makes you feel a little Christmas-y! Yes! Perfect for a summer nightcap! 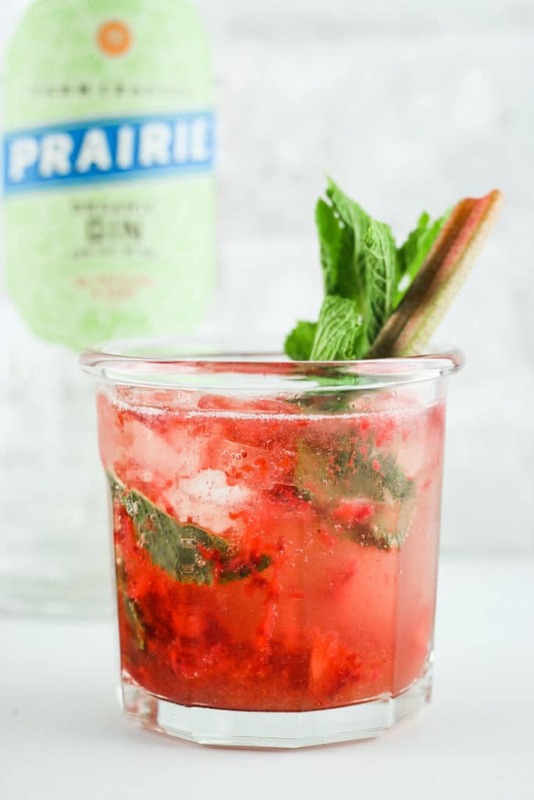 This looks like a perfect summer cocktail! Love the smashed strawberries in there. Pinning for later! I definitely need this one to refresh me up. It’s super hot here. I never tried anything like this. I can’t wait to surprise my hubby with this. It’s been so hot here too – this definitely hits the spot! Enjoy! Oh dear, this simple syrup sounds like it will be happening all summer long. This is a perfect cocktail if you ask me! Yes! It’s good in so many cocktails, plus lemonade too! Yessssss! The gin makes this drink! Perfect complement to the fresh flavors. This drink sounds refreshing and delicious. Love the use of berries in this. I would sub out the gin for vodka or rum….and ENJOY on the patio!! You could definitely swap vodka or rum for the gin! 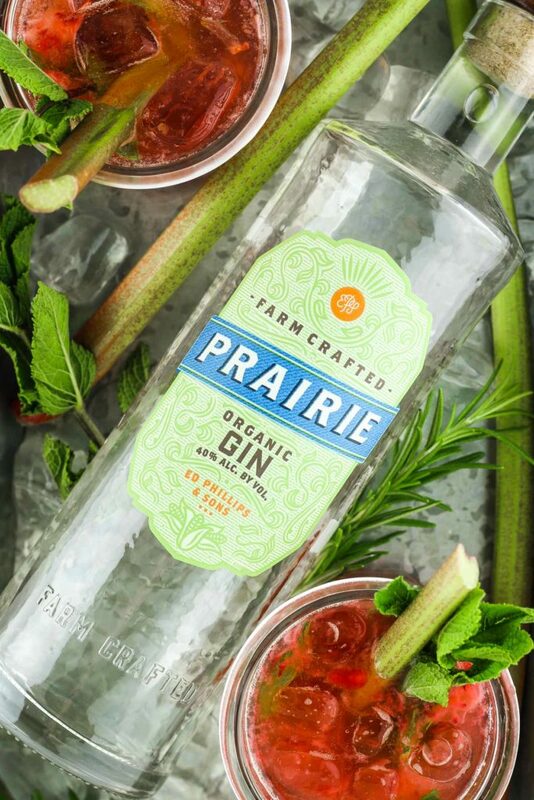 Prairie makes amazing vodka too. It’s so smooth! Happy summer! There is definitely nothing better than relaxing on the patio with a nice cold drink in hand. This looks like something my husband would love as he loves any strawberry flavored drink.